Written by: John F. Crowley on March 19, 2010. George Harrison posing with a few lads including this 1962 Rickenbacker 425! In Benton, Harrison met Gabe McCarty of the the Four Vests, a local musical group that played popular standards, and when the young Englishman mentioned he’d like to buy a Rickenbacker while in the States, McCarty drove him up the road a piece to Mount Vernon and introduced him to Lester “Red” Fenton. Red did have a Rick on hand — a single-pickup 425 in Fire-glo. Harrison admired the “cresting wave” solidbody but wanted one in black to match Lennon’s now-painted 325, so the accommodating shopkeeper refinished the 425 in black polyester and had it ready for the guitarist by the time he flew home the next week. A few days after his return, on 4 October, Harrison debuted the 425 on Britain’s “Ready, Steady, Go!” TV show, telling an admiring Dusty Springfield “I made it myself.” A couple weeks later it’s seen again on the “Thank Your Lucky Stars” program. After that, Harrison used it for the Swedish tour (late October) and the British tour (November and December). Interestingly, while the band’s van was parked outside a Glascow theater, some miscreant broke into it and stole the 425, but it was quickly recovered. Back in London the guitar played a return engagement on “Thank Your Lucky Stars” on 15 December. When he got his next Rick a few weeks later in New York, this one was summarily retired but apparently not forgotten, for at some point he added a second “toaster top” pickup and another switch, and replaced the control knobs. In 1971, Harrison gave this guitar to George Peckham, a mate from Liverpool (he played in Earl Royce and the Olympics, and later as rhythm guitarist for the Fourmost) who had become cutting engineer for Apple and rhythm guitarist for a new band, Matchbox. 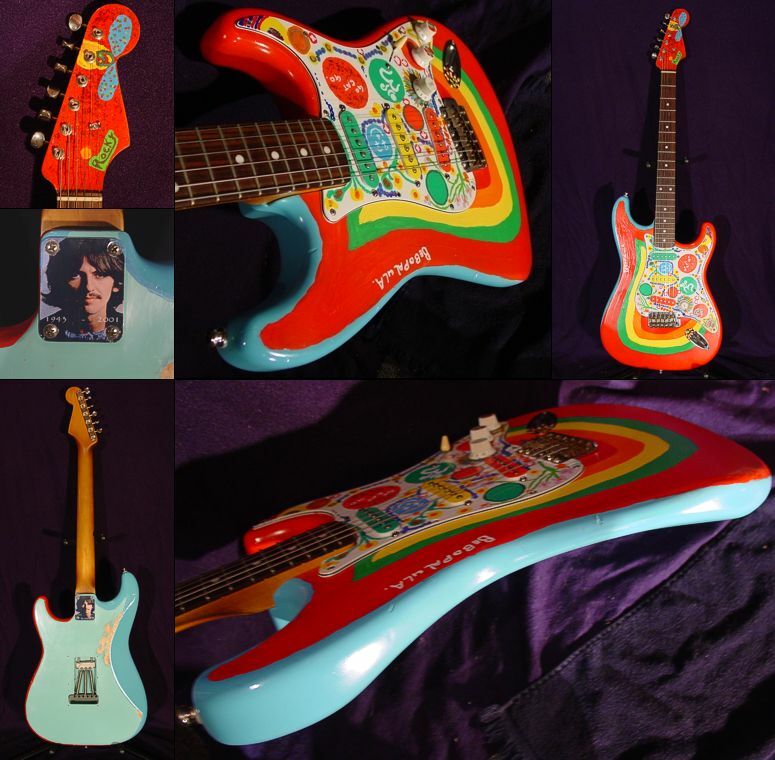 Harrison learned the band was about to appear on “Top of the Pops” but Peckham had no guitar, so Harrison loaned him “Rocky” his psychedelic-painted Fender Stratocaster. When Peckham returned it, Harrison asked him if he wanted a guitar, and offered him the 425, calling it a “great rhythm player.” Peckham kept it until September 1999, when he put it up for auction at Christie’s. Although the auction was posted as completed, for some reason the high bidder rescinded his bid, and the auction house brokered a sale to another party for £56,500 (about $90,000). Christie’s records are confidential, but soon after the sale, the Rock and Roll Hall of Fame received this guitar on indefinite loan from one Sharon Mineroff, who reportedly was apprehensive about keeping it in the house. So there it sits in Cleveland, not that far from where Harrison found it. Note: When Rickenbacker first introduced the 425 in 1958 it had no vibrato; in 1965 Rickenbacker added a vibrato unit to the 425 and designated the vibrato-less 425 as model 420.